Impressive was born 4-1-78. Sire was Don Quintana by Don Quixote, out of Ranger's Measles by Texas Ranger and out of Measles. He was grand champion at the Colorado State Fair in 1979. Many thought Impressive was the most correct TL bull ever. He was very trim, straight backed and sired mostly black speckled calves. In 1980 Wick Comer of Hendersonville, TN bought him from DCCI for $62,000, the highest price ever paid at that time for a TL bull. While in Tennessee Impressive was being hauled in an open trailer with deep straw. The Comer ranch cowboy flipped a cigaret in the trailer, it caught on fire, unknown by him for many miles, and Impressive was almost burned to death with his underparts, hair and hide burnt badly. With thousands of dollars of vet time he was later recovered enough to breed a few cows. His production was minimal. 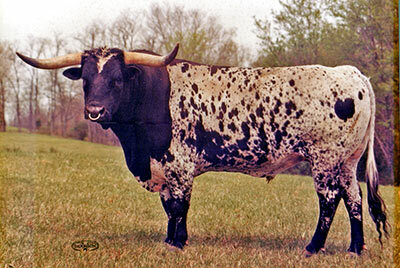 He was purchased by George Gilman of Houston and owned by him until his final days. He may be found in pedigrees of many great cattle including Field of Pearls, Cowboy Tuff Chex, Tempter, Clear Win, Drag Iron, Rodeo Max, Fifty-Fifty, and Over Kill. Impressive had a younger brother born named Emperor that DCCI sold to famous TL producer, Johnnie Hoffman.